I've decided to try and clean off th sideboard workarea. I looks like I've just been dropping 'stuff' on it randomly (which I have), for some time. Bits mostly ... thoughts ... small pieces I thought I'd do something with soon so did not put in its likely designated spot. Lots of stuff. So, thought I'd try to spend this week picking it up one by one and either putting it away, or doing something with it. For starters ... this piece of chain with the missing clasps. I don't remember how long it's been here, or even bringing it home for that matter. But, a nice sturdy piece, it is. --- Cleaned the silver and polished it up abit. --- Spent awhile going through the 'finds' and bead containers deciding on ornamentation. 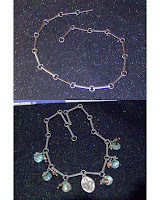 --- Selected a fleur-di-leis metal pendant, corresponding beads and little green disk thingies. --- Pulled out the silver findings containers and put the piece together. I have tiny and large clasps, nothing in between in silver. So, tomorrow, I'll have to make a stop by Michaels to pick up medium clasps to finish this piece.